Elise Ruffell Austrin studied Ceramic Design at Central Saint Martins College in London. She designs and produces handmade jewellery, tableware, framed ceramics and greetings cards in her Devon studio. Her work is sold online and through various galleries. I was introduced to pottery at school, and was studying pottery at evening classes in my local college for 15 years. In 2000 I decided to build my own studio where I fire Raku, Earthenware and Stoneware hand made pottery. Most of my work is thrown, but I enjoy hand building large ware for Raku. After biscuit firing his pots to 1000 degrees centigrade Alan smokes each pot individually. He builds a loose brick structure to suit the shape of the pot, this confines the pot so the smoke and flames are concentrated on it's surface. . Newspaper is his main source of fuel. It is surprising the small amount of paper that is needed to get a dense black. Richard Baxter is a well known British potter producing highly individual and collectable work. I make woodfired stoneware and porcelain pots as well as gas fired celadon glazed pots. Catherine graduated from Sunderland University with a BA (Hons) in Ceramics. Drawing inspiration from early happy memories of tickling piglets through the fence, to the farm next door, she makes a range of Pigs. 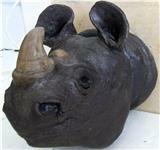 Other hand-built animals are now incorporated into her range of work; from observations of animals or her imagination. Holly Bridgestock-Perriss is based in the old market town of Tenterden in Kent, she was privileged in growing up on a farm spending most of her childhood riding around the Kentish countryside on horse back and helping her father with the livestock. 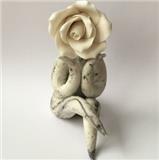 She went on to study veterinary nursing and now spends her time as a full time artist painting with oils and sculpting in ceramics, using her knowledge and love of animals as her main inspiration. I am a figurative but imaginative artist that is largely inspired by nature. I particularly like to paint window views and like the feeling of combining the domestic objects of the interior with the external natural world outside. obsessive reative is a acurate description, I have alsways needed something to do or make. I paint in the summer and print make and scultp in the winter. I am based in North Devon and Exhibit accross the south west in galleries, hotels and restaurants. See www.rosieburnsartist.com for more of my wotk and to purchase on line. Jean creates colourful pieces which are both whimsical and and unusual, and cover subjects ranging in style from Beryl Cook to Picasso. 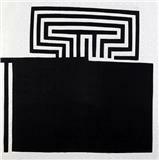 She works from her studio in Essex which is always open to visitors as a welcome distraction from work. 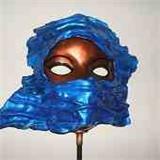 I am a contemporary sculptor working in a range of mediums. I am passionate about the origins of evolution and humanity. I believe art will only 'sing' if it is hewn from the unremitting exertion of honest observation. I work within two discipline's; 1. Figurative, from an emotional perspective. 2. Abstract, interpreting the earth's elements and evolution. 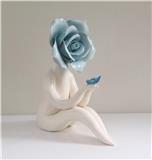 Hi I'm Carolyn Clayton a ceramic sculpture artist developing flower people. Having worked as a bone china flower maker part time at Coalport since 2004, I came up with the idea of my flower people one evening. 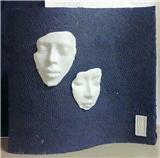 They are handmade using either parian clay or porcelain. Contemporary, ceramic wall panels and prints inspired by rhythmical and repetitive patterns in the landscape. 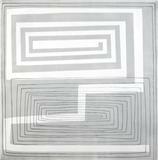 The abstract ceramic designs are created by utilising inlays of different types of clay. Fine lines are etched directly into the surface. A sparing use of oxides and glaze produces subtle colours and preserves the natural stone-like textures. 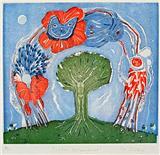 Prints are collograph etchings in small limited editions of 10. Suzanne takes her inspiration from the sea, ancient cultures and the whimsies of nature! Depending upon the pieces being created, she may coil, throw, pinch or use slabs and hand decorates with natural oxides and brush-on coloured glazes. She works with both earthenware and stoneware clay. Alison Day is a multimedia artist, designer, illustrator, who enjoys trying out new art processes to realize her ideas. A favourite is using re-cycled materials as decoration in her work and to up-cycle old objects into new. My ceramics achieve a balance of artistic creativity, suggestion, form and gesture, the textured markings and earthy colours help to create a certain warmth and tactile feeling. They are allowed to be fresh and ever changing, expressing their own form and meaning with inspiration drawn from my imagination and the elements of our natural environment. I make complex textured surfaces on minimal forms inspired by the natural processes of erosion all around us. I take inspiration for my forms from geometric shapes and the architecture of the industrial landscape and seek inspiration for my surfaces where manmade meets the environment. Sculptural handbuilt ceramics inspired by the cross sections of seedpods; Aimeé explores the subtleties of form and the relationships between internal and external space whilst considering the interplay between the different forms. With no pre-determined base the pieces can be displayed in different positions and contrasting colour affects how the form and the space around it is perceived. Contemporary sculptural ceramics. 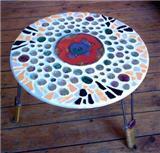 Mosaics, ceramic and peble wall and floor artwork, to commission. Ceramics of desire and contemplation inspired by the dynamic forces of the earth.